Hot off the virtual presses, Penguin Books has released The Complete Idiot's Mini Guide to Real-Time Marketing by Trivera President Tom Snyder. This e-book is a quick read, and is essential for anyone with a brick and mortar location who wants to capitalize on the segment of Social Media known as Geo-location marketing. Foursquare is a website that allows members to use their mobile devices and smart phones to "check in" wherever they go, and if they wish, Tweet about it or post it to their Facebook page. While originally a way for people to hook up with their friends, Foursquare's point system and badge awards turned it into a game. It wasn't long before businesses started to figure out how to use it to drive traffic to their locations by offering special prices and other promotions to people who checked in at their locations. About the new e-book, Penguin says: Social media marketing is here in force and is the wave of the future. Using it wisely can mean big profits -- with little expense. But marketing in real-time on Foursquare.com is unlike other social media, and can be both confusing and daunting. Fear no more! 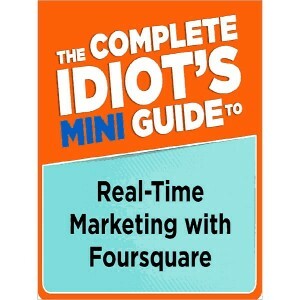 The Complete Idiot's Mini Guide to Real-time Marketing with Foursquare gives you everything you need to know to make marketing on this website popular and profitable. In this invaluable guide, you'll learn about creating and managing your venue, superusers, badges, creating specials, and finding customers -- all the basics for a great Foursquare marketing campaign and so much more! The Complete Idiot’s Mini Guide to Real-Time Marketing takes you through the steps to get you familiar with the site, make sure your location is "check-in"-ready, helps you create specials, measure and improve upon your success, and even offers a few case studies of several successful businesses who have used Foursquare to make their cash registers ring.